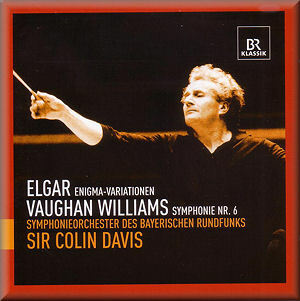 Sir Colin Davis’s live recordings of Elgar’s symphonies were amongst the earliest releases on the London Symphony Orchestra’s own label. I reviewed them here in 2003. Others had been almost wildly enthusiastic, so I was surprised that all three performances struck me as self-indulgent and lacking in drive. I was also distracted by conductor’s vocalising. Here he is, twenty years earlier, with the German orchestra of which he was Chief Conductor from 1983 until 1993. Davis plays the “Enigma” theme very straight, the pulse hardly wavering. This is refreshing and effective, and the following variation, dedicated to the composer’s wife, follows, as it should, at exactly the same tempo. This variation, beautifully paced and played here, provokes the only really audible groan from the conductor. Mr. Steuart-Powell (Variation II) is a bit more boisterous than usual, but none the worse for that, and Davis’s reading of “W.M.B.” (Variation IV) is superbly incisive. Matthew Arnold’s son (Variation V) is significantly slower than the metronome mark, the wandering, unison string theme sounding very romantic indeed, and not a little melancholy. The flowing “Ysobel” (Variation VI) features very reedy, un-English sounding bassoons. It is again slower than marked, but this doesn’t stop it being one of the loveliest readings I have heard, sincere and tender. Davis takes a slight liberty with the long, held G that leads into “Nimrod”, but it’s so effective one forgives him, and the variation itself is superbly done. Has there ever been a more moving musical tribute that this? A longer silence would have been welcome before “Dorabella” (Variation X), and I’ve heard this done more affectionately, though George Sinclair’s dog Dan is vividly brought to life in the following variation. Elgar’s cellist friend is in danger of sounding effete in Variation XII (B.G.N.) in what seems to me the only damagingly slow tempo in the whole performance. The slow passages of (***) (Variation XIII) are also taken substantially more slowly than the score demands, for example, but the music can stand it, and the remarkable recreation of the sound of a steamer’s engines is most vividly brought out in this performance. I find the final variation, the composer himself, to be the least successful. The brass playing lacks the last degree of refinement, and the reading doesn’t quite swagger as it should. Overall, though, this is a very fine performance indeed, and one is happy to be reminded of what a masterpiece the work is. Although Sir Colin has conducted Elgar’s music throughout his career, he has neglected that of Vaughan Williams. Indeed, the only other recorded Davis-conducted Vaughan Williams work I have heard is The Lark Ascending, played by Hilary Hahn, and all but ruined by the conductor’s over-expressive accompaniment. Here, in live performances from Munich, he tackles Vaughan Williams’ most pessimistic symphony. The first movement begins very well, very broad and powerful. The rushing, syncopated semiquavers are brilliantly done and for a while everything is very convincing. But compared to the conductor’s finest rivals, there is a certain lack of menace. The power is there, and there is no lack of surface brilliance, but it’s not threatening enough. In the finest performances, when the big tune arrives near the end of the movement, we are not fooled: we know, from the outset, that this is not what it seems. In the present performance it sounds almost - but not quite - like a waltz, and the transformation of this tune, over only a couple of bars, into the music of the symphony’s opening, does not horrify as it should. Andrew Davis, originally on Telarc, gives the finest performance of this symphony I have ever heard, and he contrives to make this big tune an oasis of hope, broad and noble, and the only one in the work, so that its transformation is horrifying, a door slammed in the face, never to be reopened. Andrew Davis is more successful in the second movement too, where he keeps a strict metrical approach to the horrible, repeated rhythmic figure. Sir Colin is freer with this, and some of the horror is dissipated. He is, however, absolutely superb in the central section, with all those divided strings, the concentration and intensity of the playing really quite remarkable. He and the Bavarian players are very fine in the scherzo too, though the saxophone soloist simply doesn’t manage the same sick, sleazy swing as his London counterpart. He begins too loudly, too - it is marked piano in the score - and is balanced rather too far forward. The final movement is superb, as lacking in human warmth, even human presence, as any of the finest performances. Inevitably a few coughs are heard from the audience, but they do not break the atmosphere. How many in the audience were familiar with the work and what did they make of it.